Cowell Ranch is 1,270 acres of rolling, grassy hills, seasonal streams and sandy beaches. Hawks sweep over farm fields and fields of coyote brush, dock, wild radish and mustard. In summer, wildflowers color the hillsides. And year-round, farmers continue to work the land. Once owned by the Cowell Family, the land was put on the market in 1985 to raise funds for the Cowell Family Foundation. Developers were eager to acquire it – as was POST. The Cowell Foundation offered POST one year to raise $2 million to acquire the property. With the help of donors, POST was able to leverage private contributions to obtain a matching grant from the Cowell Foundation and state bond funds. POST completed the purchase in 1988. Today, the trail and spectacular beaches here are part of the California State Parks system. After permanently protecting the ranch through a conservation easement, POST sold nearly 1,200 acres to farming families for row crop agriculture and cattle grazing. 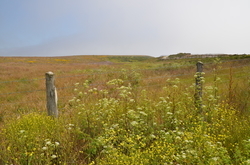 In July 2011, the property’s ocean overlook became the northern trailhead of the 3-mile-long Cowell-Purisima Trail. This trail is part of the California Coastal Trail that, one day, will span 1,200 miles down the coast. Discover the Cowell Ranch for yourself! Get started here.